Our property is uniquely suited to horse clubs and individual owners wishing to take their horses on an equestrian vacation. 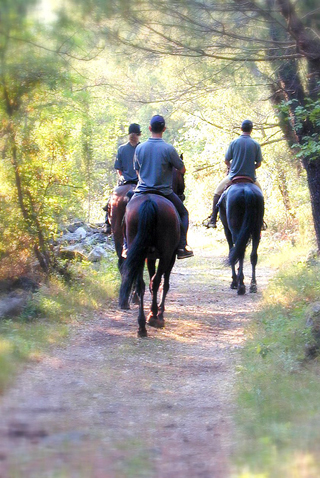 We are located next to the "Forêt Domaniale de Camors" with direct access to miles of horse trekking trails. As horse owners ourselves, we have large fenced fields, a large stable block and an outdoor exercise area. From beach rides (out of season) to treks, Brittany offers over 2,000 kilometres of bridle paths (signposted with orange markers), of which the local "Forêt Domaniale de Camors" with private access and "Forêt de Florange" offering excellent trecking. There are a number of local stables offering pony trekking and horse trails through forests. One of the nearest equestrian centres is L'Etre Cheval at Coz Camors (3 miles). We offer pasture* and livery* facilities with ample parking for boxes and trailers. * Subject to availability. Out of season bookings are available... For further details contact us at bergeronnettes@hotmail.com.